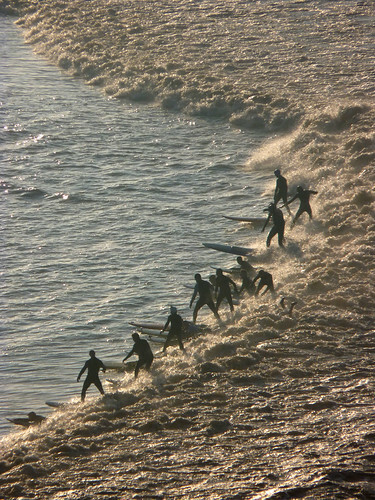 The River Severn in South West England has the second largest tide in the world and the 'Severn Bore' is one of the world's longest waves - attracting large numbers of surfers who attempt to ride it. The Severn Bore is a natural phenomenon that occurs around the spring and autumn equinoxes when tidal forces push a wave of up two metres in height along the Severn Estuary at up to 16km an hour. The UK's Environment agency publishes predictions of wave size and times here, and whilst initally predicted to be '4 star', today's Severn Bore was the first '5 star' Severn Bore for 8 years with a huge wave rolling along the River Severn. Some TV news featured the wave, but the age of self-publishing / citizen journalism means there is far more coverage of the Severn Bore online with some incredible photos and stunning footage being shared through social platforms. If it's good enough it will bring people together and they will want to talk about it and share it. This morning it was a force of nature that got the Conversation going followed by social channels amplifying the Conversation and allowing it to be shared with a larger audience - the Severn Bore is a local event, but social media globalises it. There are endless potential puns about waves, ripples and undercurrents here, but I think there is a lesson - if the content / event is compelling enough then people will get involved in a variety of ways - either directly interacting, in this case surfing and chasing it in boats, or spectating, from a variety of vantage points (on the bank, from above etc.) The same content is viewed through a variety of lenses creating a different experience for different groups (surfers vs local family day trip?) which can then be shared through different channels.